Remove the greenery from the carrots and turnips about 2 cm from the root. Clean and wash the carrots and potatoes. Peel the turnips and leave them whole. Remove half of the green onion stalks and peel the onions. Halve the larger onions lengthways. Wash the snow peas. Separate the garlic cloves from each other and leave whole. Brown the onions in oil in a Cocotte. Then add the carrots, turnips, potatoes and garlic cloves. Season with cumin seeds, ginger and saffron and add salt and pepper. Pour in a large glass of water. Cover the Cocotte with the lid, turn down the temperature and simmer for 40 minutes, stirring occasionally. Half-way through the cooking time add the snow peas. Wash the coriander and let it dry. Pluck off the leaves. Remove the vegetables from the juice, then reduce the juice. 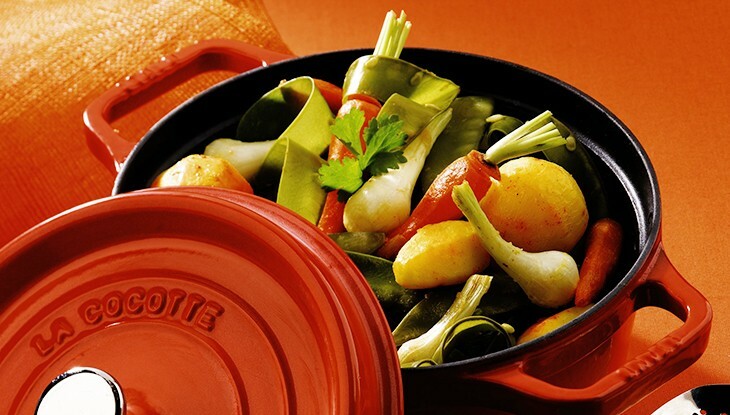 Place the vegetables back in the Cocotte, stir carefully and ensure the vegetables are completely covered by the juice. Garnish with coriander. The dish can be served in the Cocotte. This can be served for example with a fillet of fish grilled in the oven. This dish can also be prepared in the Tajine.